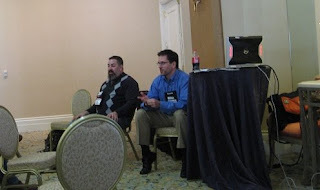 Presented by Aaron Silvers and Mark Oehlert in the Social Learning Camp, I knew this topic was going to be interesting. The discussion started with a question, that was never really answered. In fact, as suspected this whole topic is pretty airy fairy because in order to measure social learning, you have to first define social learning. Since no one in the group had a concise definition of social learning, the metrics can't really be identified, hence there was no real answer...yet. What does social learning look like? How do we measure it? What are the metrics? All great questions which were set out to be answered, but it was definitely overly optimistic. The usual objections to social learning came through in general audience responses, which are the same as those addressed in the last session I attended in the Social Learning Camp. Some people just concerned with results, not the learners experience. Silvers wrapped up by saying that we need to 'give social learning some time to breathe - lets figure out what it is before we start to apply measures to it'. Then the discussion turned to Facebook and how was it that 'that kid' could develop such an amazing LMS (essentially) that handles millions of data transactions, while so many vendors out there with years of experience that are handling way less data transactions, are failing. It's a good point. There was a show of hands for anyone that knew of an LMS provider that actually wanted to make learning fun, and easy and exciting for the learner, like Facebook is for users. Sadly, not a hand went up (I guess they haven't seen our customer feedback ;o)). This topic sure pulled in the DevLearn09 crowd - I think it was Silvers that made the comment that he'd never seen so many people that actually wanted to talk about SCORM.